The use of mobile apps for health and wellbeing has grown exponentially in recent years. Given the rapid spread of smart phone apps, it is increasingly difficult for consumers, health professionals, and researchers to find high quality apps. In fact, many apps are downloaded and not opened again beyond the first use. Our postgraduate programs allow candidates to undertake advanced research leading to a Master's or PhD degree under the supervision of experienced senior research staff in one of AIHI’s research areas. Current research opportunities at AIHI. Biederer M, Arguel A, Liu J, Lau AYS. 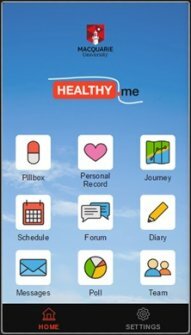 From web-based to mobile: experience of developing a personal health management system. electronic Journal of Health Informatics (eJHI). 2014;8(1):e9.